It is ridiculously difficult to get a pizza delivered to 1600 Pennsylvania Ave.
First Daughter Audrey Rhodes can’t wait for the party she has planned. The decorations are all set, and the pizza is on its way. But the Secret Service must be out to ruin her life, because they cancel at the last minute for a “security breach,” squashing Audrey’s chances for making any new friends. What good is having your own bowling alley if you don’t have anyone to play with? Audrey is ready to give up and spend the next four years totally friendless—until she discovers Alice Roosevelt’s hidden diary. 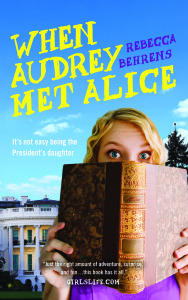 The former first daughter’s outrageous antics give Audrey a ton of ideas for having fun . . . and get her into more trouble than she can handle.